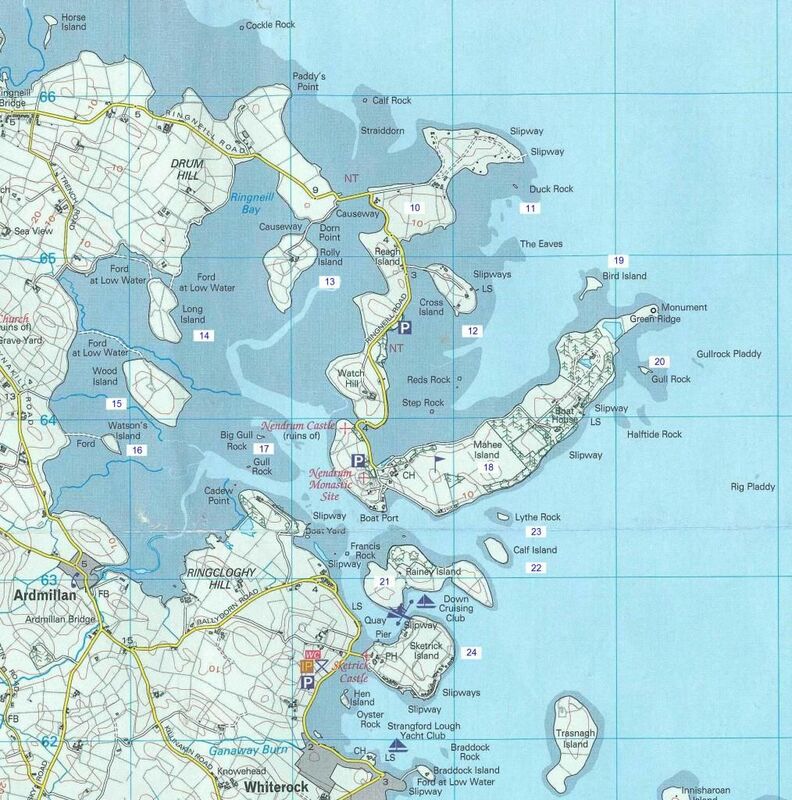 During My Strangford Quest I identified and landed on 164 islands. An island is defined as having grass above the high tide line. I have divided the islands into 9 groups. 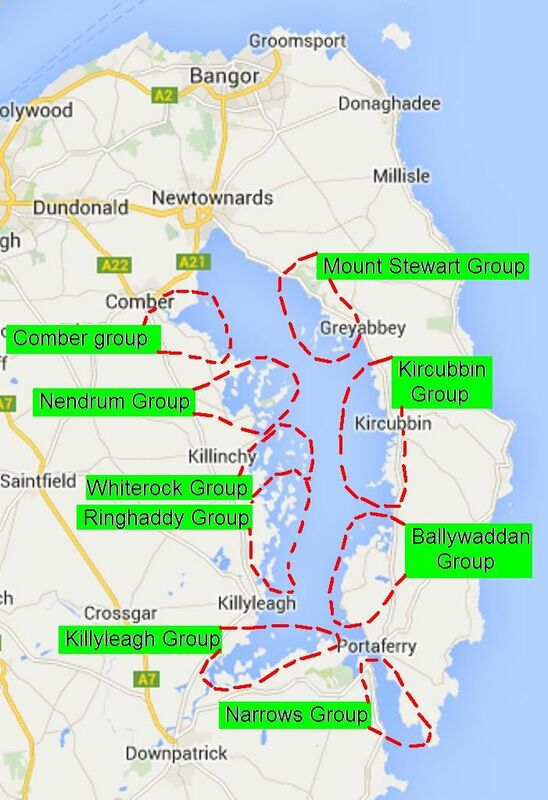 1 Comber Group, 9 islands. At the northern end, on the west side of the lough is the comber river, up which is the Comber Boat Club. At this club there are islands 1 and 2. For larger boats the club is only accessible at high tide. Access to the water at the club is for members only. Further up the river is a small slipway at the playing fields behind the Police station giving canoe access. The river is best paddled at high tide, but can be run downstream if the river is in flood, with a little wading at the shallow bits. Halfway down the river is island 3, this can be covered by spring tides, and access onto the island is not easy as the banks have soft mud. 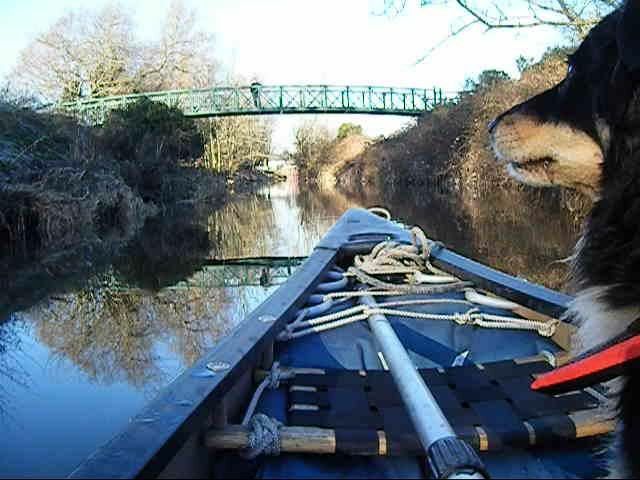 The first run up the Comber River was a test run using a spring tide to see how far I could get up the river. I was not at this point trying to land on all the islands. It was a great day out. Coming into Comber at the top of the tide. Some time later I made up a video of that run, blog. When I had commenced my island Quest I had to retrace my steps and repeat the run up to the boat club, done with a neap tide, thus I had to start earlier in the tide cycle. Blog. The southern access for the Comber River is at the Islandhill carpark where there is a slip. Islandhill is now landlocked with farm buildings on it. Connected to the carpark by a causeway is Rough Island (4). This is my favourite dog walking site. 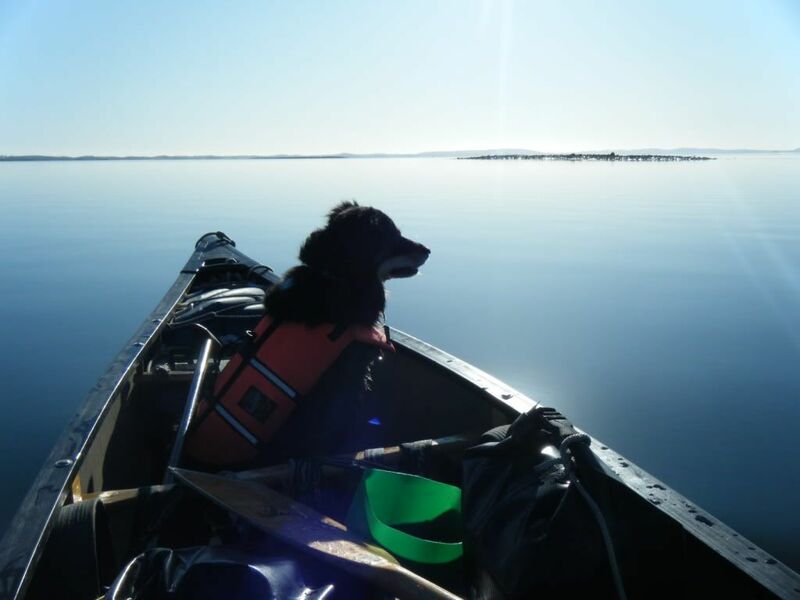 I have paddled to this island at high tide. The best paddle here is to set off 2 hours before high tide up the river, take a lunchbreak by the boatclub, and then follow the tide back out again. Close to Rough Island are Ogilby (5) and Black (6) islands. I have walked to these at low tide. Ogilby is a bird island and should be avoided during the nesting season. Black Island is a sparse patch of weeds hardly classing as an island, but has an interesting ancient fish trap made from a large ring of stones. A large area of tidal mud flats at the north end of the lough comes alive twice a year with thousands of migrating geese and is a spectacle worth seeing. South of Rough Island is a pair of islands on their own called Horse Island (7 and 8). 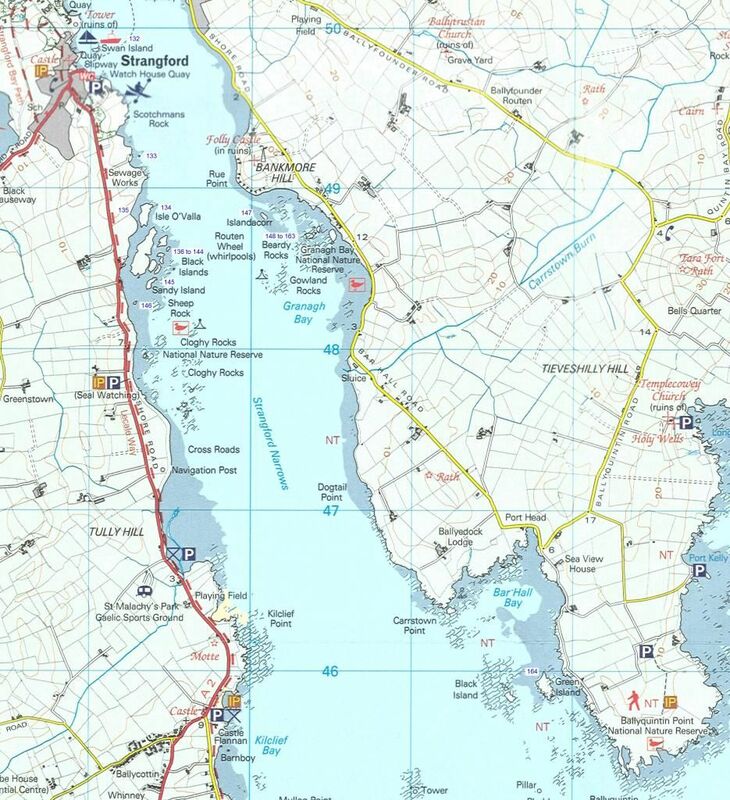 This is too far across the exposed north end of Strangford to be practical to reach from the Islandhill slip. They are easier to reach from the mainland end of the causeway to Reagh Island. Just inland from the Horse islands is a small inlet of Ringneill Bridge which makes for a scenic paddle at high tide. A small islet (9) is at its mouth. 2 Nendrum Group, 15 islands. 22 Calf Island 23 Lythe Rock 24 Sketrick Island. 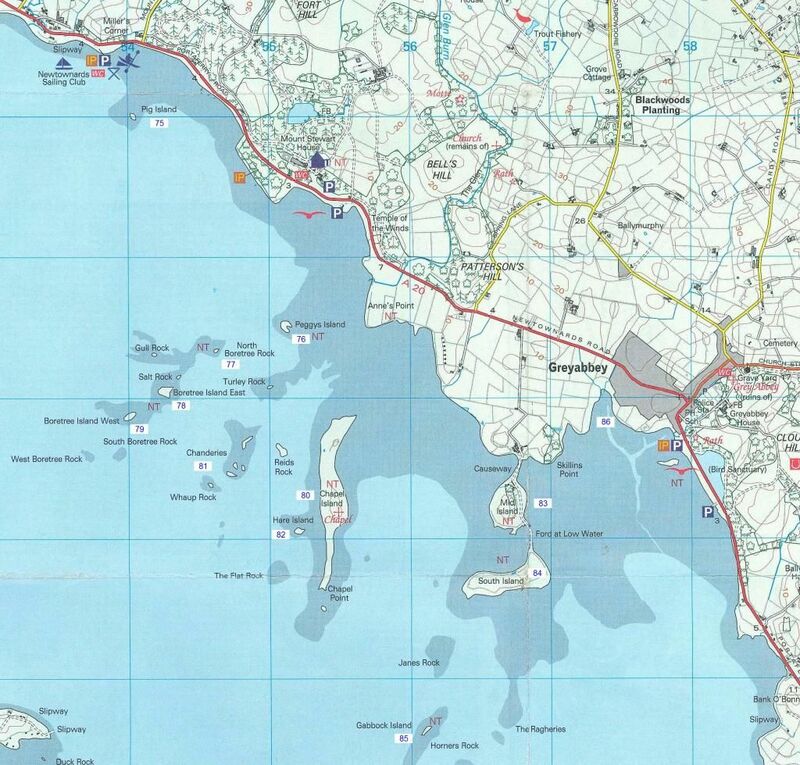 Reagh Island (10) is accessed normally by car on the way to Mahee Island and Nendrum Monastic site. There is a car park on Reagh Island good for a picnic and possible to launch at high tide. From the Mahee Island (11) car park you can launch to the north over a medieval fish trap and watermill, high tide only. With a bit of brass neck you can launch to the south at any tide state by trollying through private property. We did a circumnavigation of Mahee, setting off to the north and arriving back from the south. Approaching the monument of the tip of Mahee. Duck Rock battery boat, blog. The channel between Mahee and Rainey has a good tidal flow and with suitable timing makes for a good ferry gliding site. The inner bay at Nendrum dries out at low tide to glutinous mud. The islands here can be best accessed from the jetty and slip at the Down Cruising Club. This jetty is posted as private. 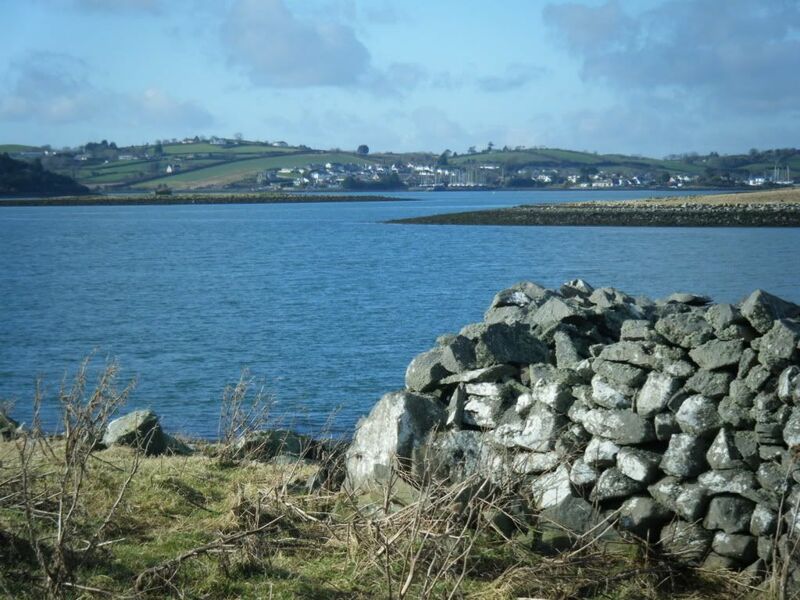 The inner bay is known as The Dorn locally, not to be confused with a similar bay on the other side of Strangford. Last edited by Mr Nick; 13th-October-2014 at 07:29 PM. 3 Whiterock Group, 19 islands. 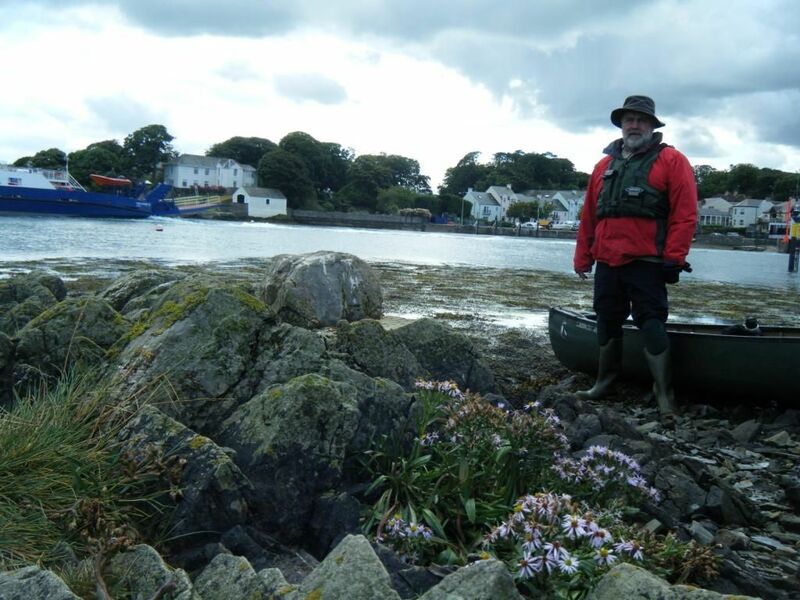 Whiterock has a public access slipway and is the best launching point in Strangford with sheltered access to some of the most beautiful islands. Good at all tide states. This was where I first tried my electric outboard motor to help extend my range for a days paddling, a grand success. 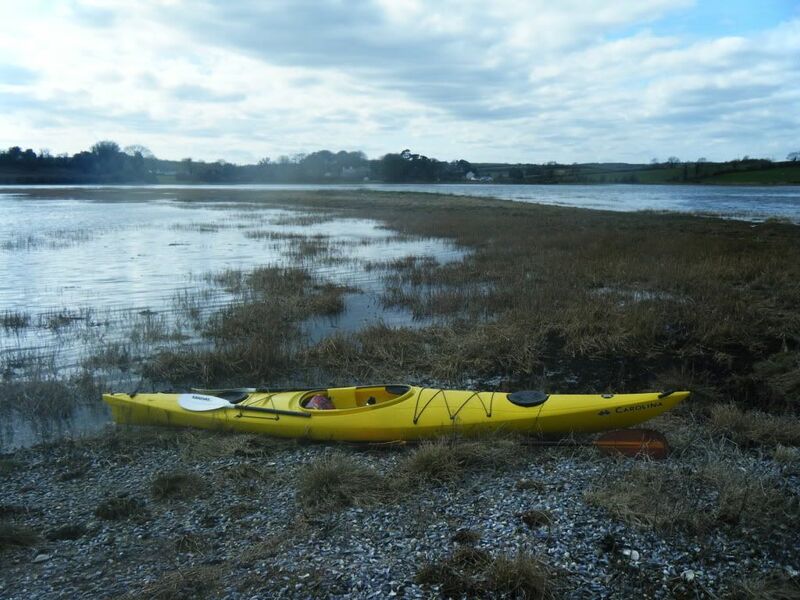 Ballymoran bay is a high tide paddle with some very good small islands, very good for a picnic run. 4 Ringhaddy Group, 15 Islands. Ringhaddy is an excellent sheltered mooring with public access on the slip beside the jetty. Parking for only four cars, and no room for trailers. The jetty itself is private property. The north half of this group can be explored from the Ringhaddy jetty. Pawle Island (50) is owned by the farmer that my wife works for, and is available for camping with permission. I did a great battery boat run around this group. 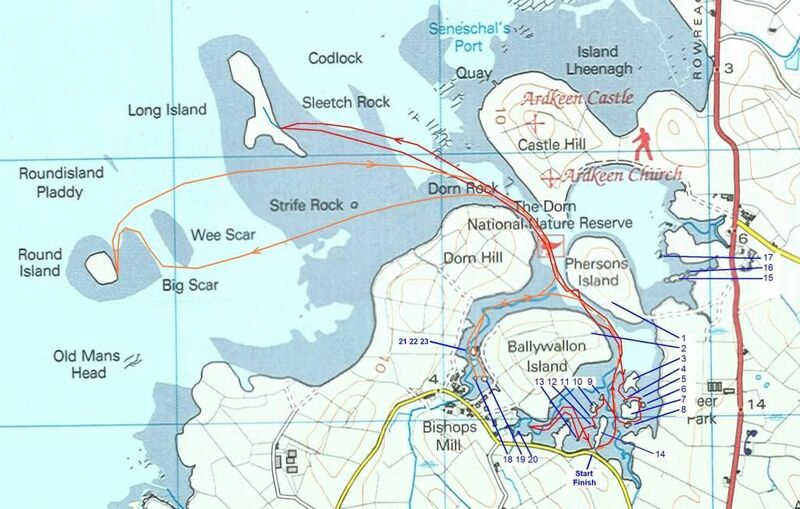 The southern half are better reached from Killyleagh. Big Al accompanied me on a battery boat /sailing exploration of this group. The owner of Simmy Island (53) is fiercely proud of his kingdom, beware all who attempt to land there. The Dunnyneill Islands (57 and 58) are out in the centre of the lough and require a confident forecast of calm weather to reach them. I have been on them about 35 years ago on a rowing boat with an outboard, I need to plan a paddle in the canoe some day. 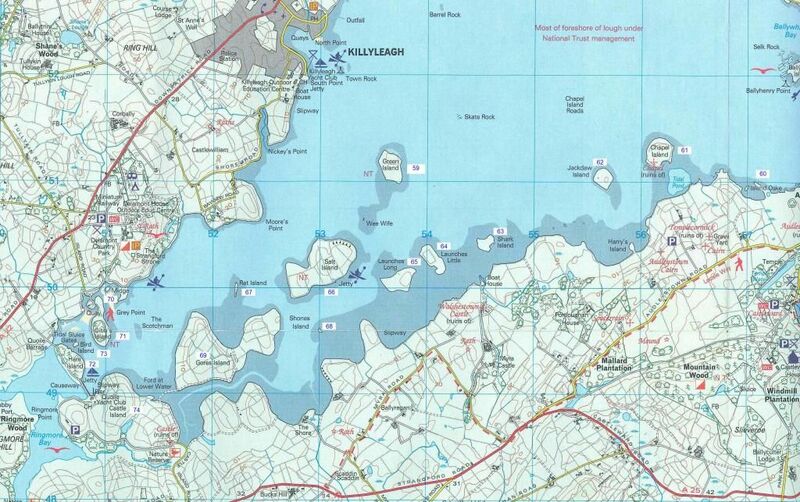 5 Killyleagh Group, 16 islands. 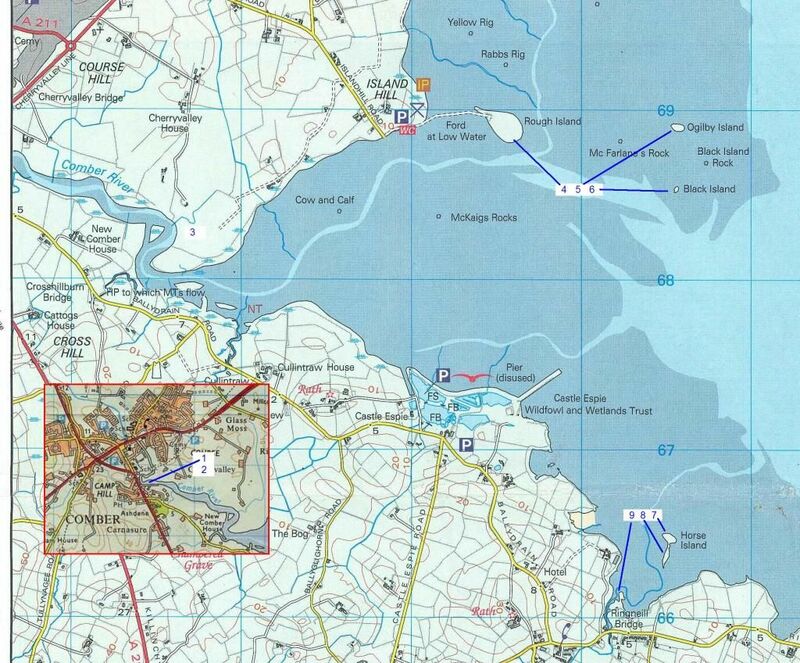 Access is normally from Killyleagh village across an exposed section of the lough. A more sheltered launch is available on the Shore Road south of the village. Salt Island (66) has Bothy and camping area. Big Als blog of a winter trip to Salt Island (66) covers the start of my formal Quest to land on all the islands..
Bird Island is a small island at the south west corner of the lough. 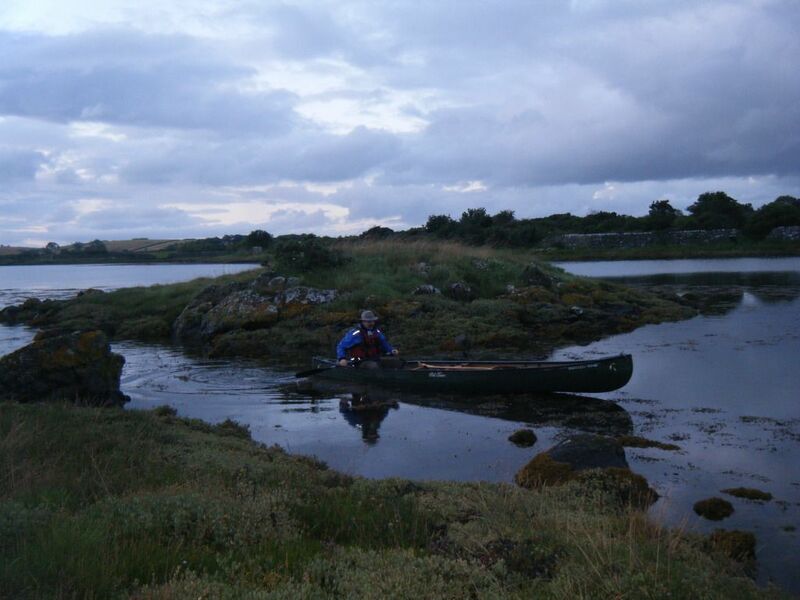 I landed on most of the rest of the Killyleagh Group with a small dingy and petrol outboard duing a camping trip with my son. I need to go back there with the canoe. One small that got missed on that trip was Island Oske. The Mystery of Island Oske, blog. 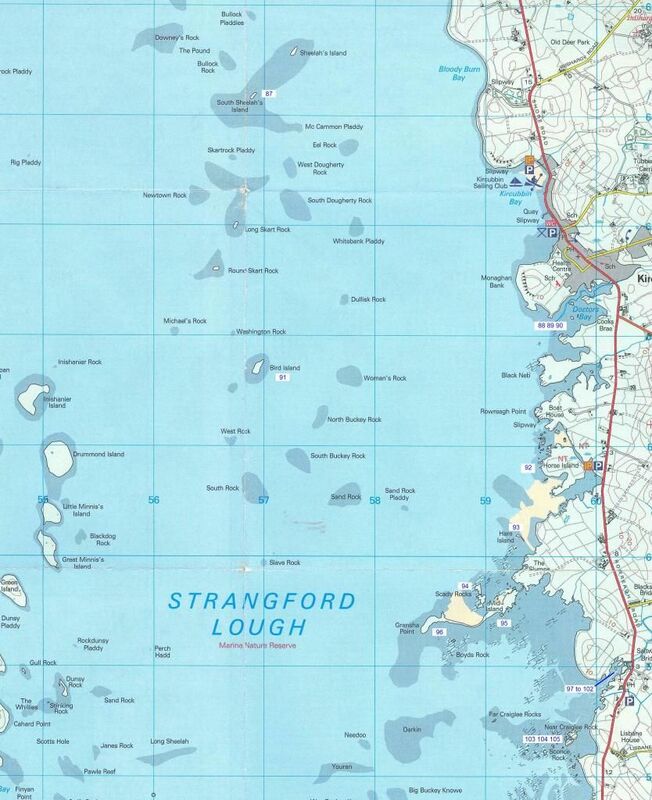 The eastern shore of the lough is more exposed to the prevailing westerly winds and the islands tend to be more isolated, making trip planning more critical. 6 Mount Stewart Group 12 Islands. 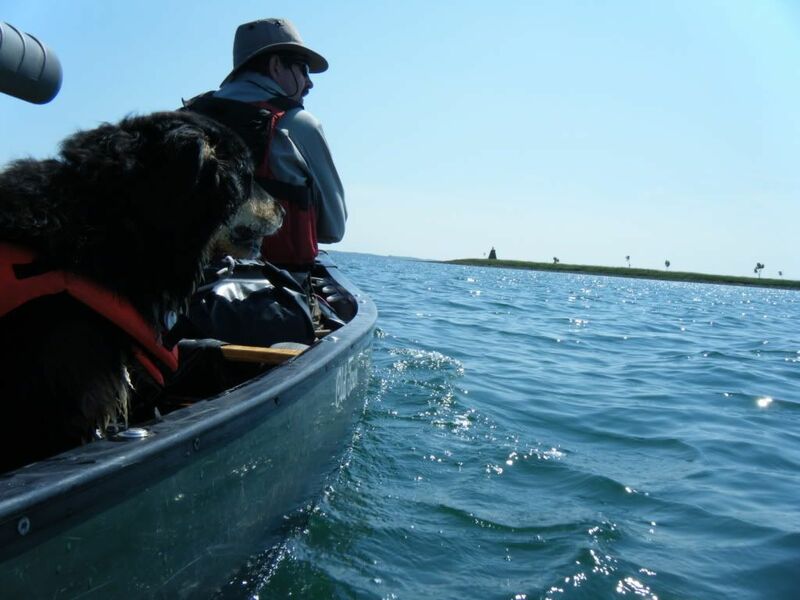 Pig Island (75) is a small island on its own near a canoe trail launch point and car park. 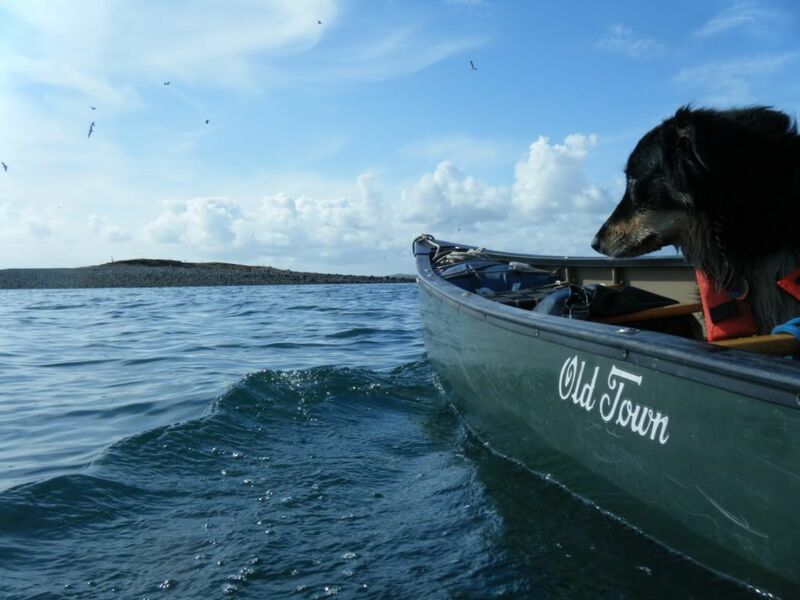 It can be walked to, and was the first of my high tide chapter to paddle to the islands that I walked to on the first round. 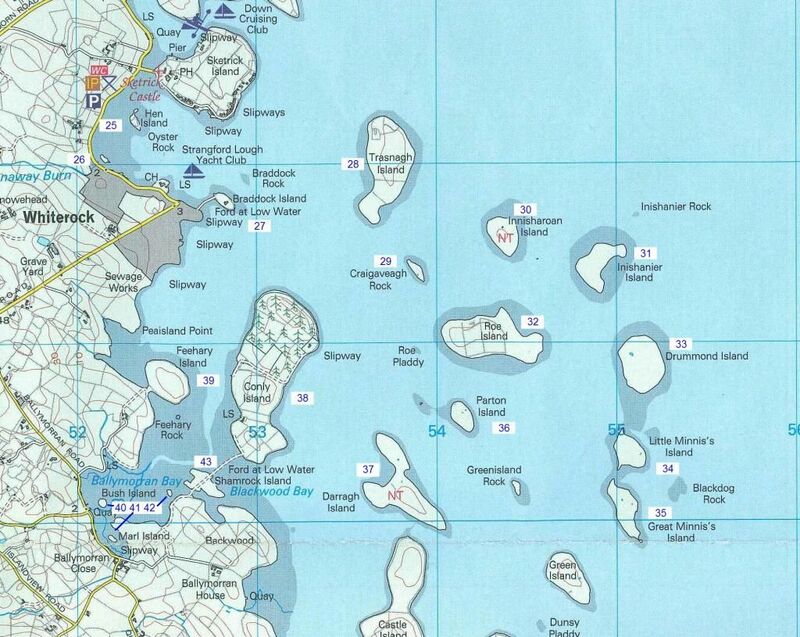 The Boretree Islands (77 to79) are beautiful, very natural and a bird reserve. No visiting during nesting season. Chapel Island (80) is good for a campout. 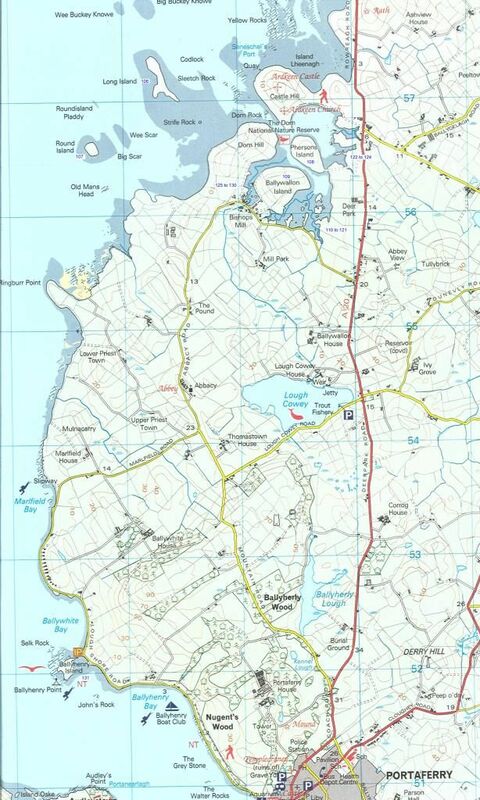 Mid Island (83) and South Island (84) can be walked to from a car park on the south side of Greyabbey. 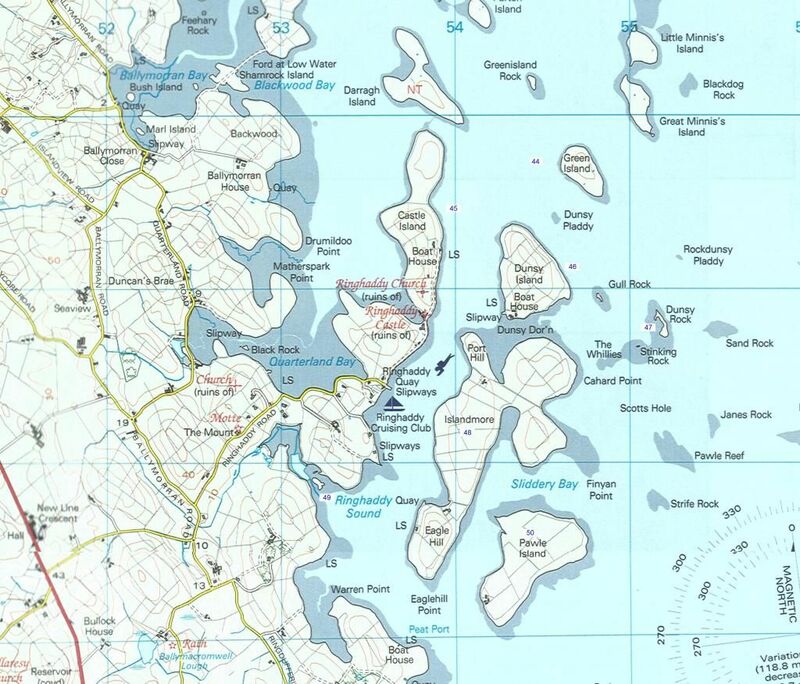 Gabbock Island (85) is on its own in an exposed part of the lough and needs careful planning of tides and weather. Stretching the legs on the Chanderies. Heading for South Sheelahs Island. Gabbock Island and South Sheelahs Island, blog. Last edited by Mr Nick; 13th-October-2014 at 07:30 PM. 7 Kircubbin Group 19 islands. Doctors Bay islands (88 to 90) make a great walk at low tide with access from the garage at the south end of Kircubbin. Bird Island (91) is on its own in the open lough and needs a calm day. Also not during nesting season. Bird Island on St. Patricks day, blog. 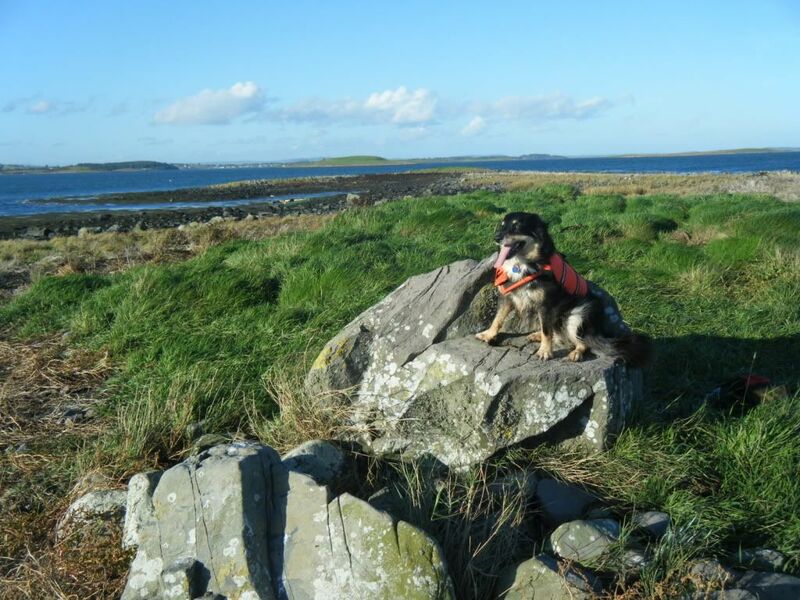 Horse Island (92) has a car park beside it and has a great low tide walk out to Hare Island (93), Scaldy Rocks (94), Mid Island (95) and Gransha Point (96). The Saltwater Islands (97 to 102) are another low tide walk from the car park opposite the Saltwater Brig pub, taking in the Near Craiglee Rocks (103 to 105). 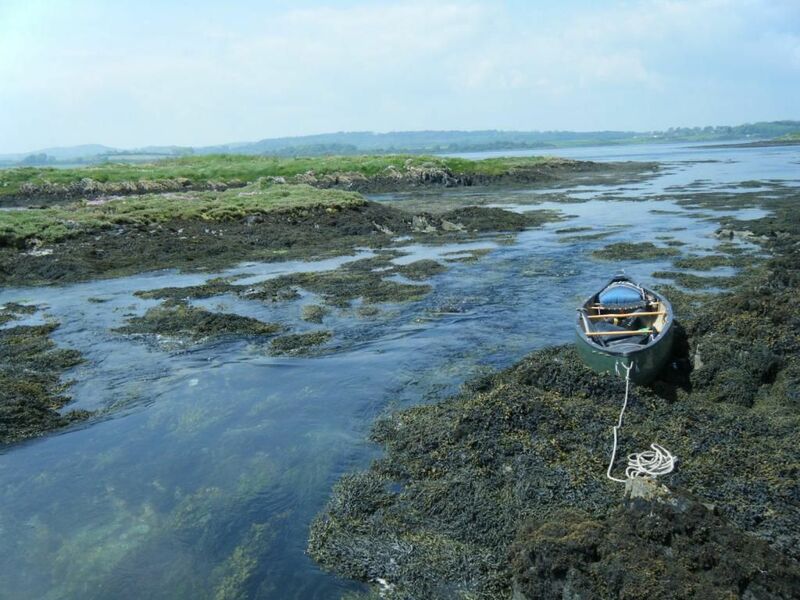 The Dorn is a traditional Irish name for a bay that mostly dries out at low tide to an expanse of glutinous mud. This Dorn has 23 islands in it that can only be accessed at high tide. Long Island (106) and Round Island (107) are best reached from the Dorn, thus they are a high tide dash. There is very poor access to the north and south of the Dorn. Island hopping in The Dorn. Long Island and 15 islands in the Dorn, blog. In the Dorn at high tide, island 23 from island 24. 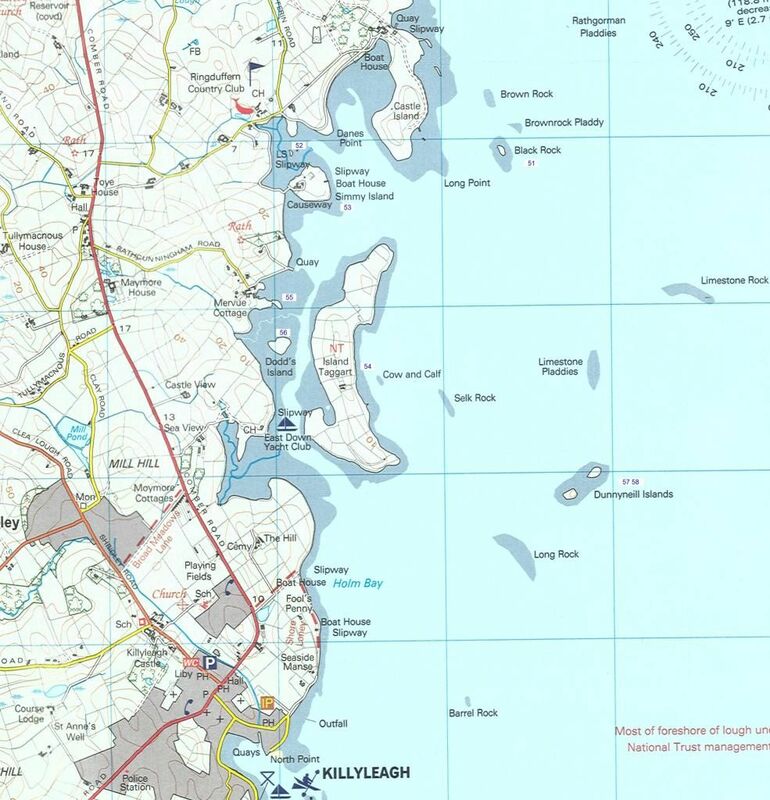 Ballyhenry Island is on its own close to the coast road into Portaferry, is easy to walk onto and makes a good picnic site. The Narrows is a strong tidal area, caution is needed when planning trips here. It is recommended to run trips with the incoming tide, as the outgoing can take you to the Isle of Man. The Black Island group does not have a good access nearby and is best explored as a tidal run with a shuttle. 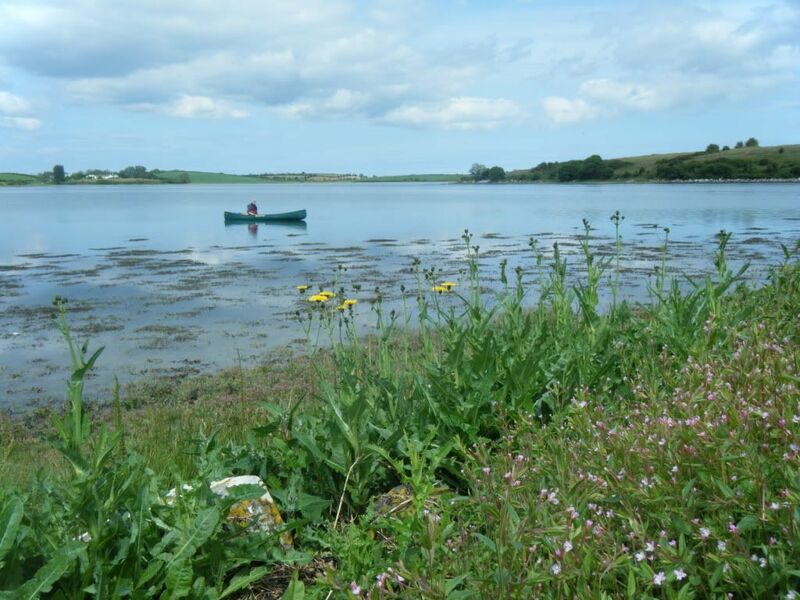 Swan Island (132) in Strangford village is a nature reserve and landing is discouraged. 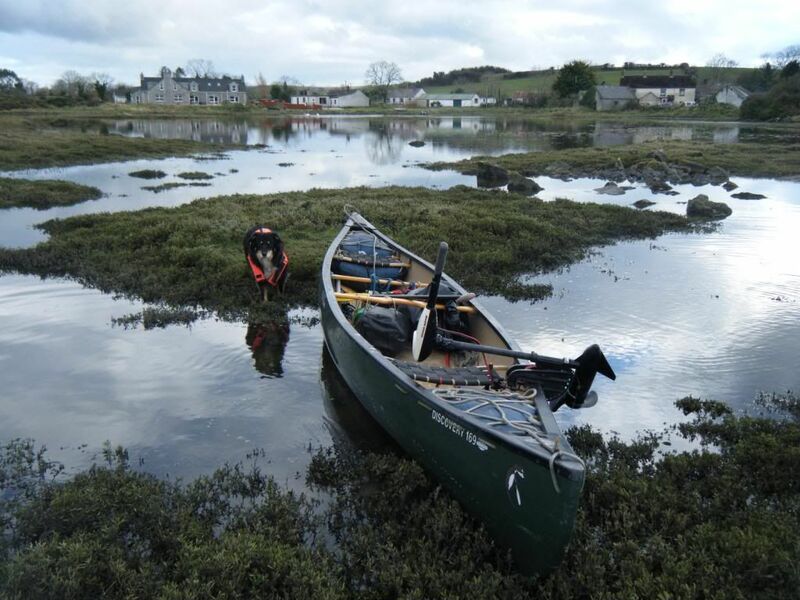 I used the fact that I am a volunteer ranger for the Strangford Canoe Trail to blag my way on. 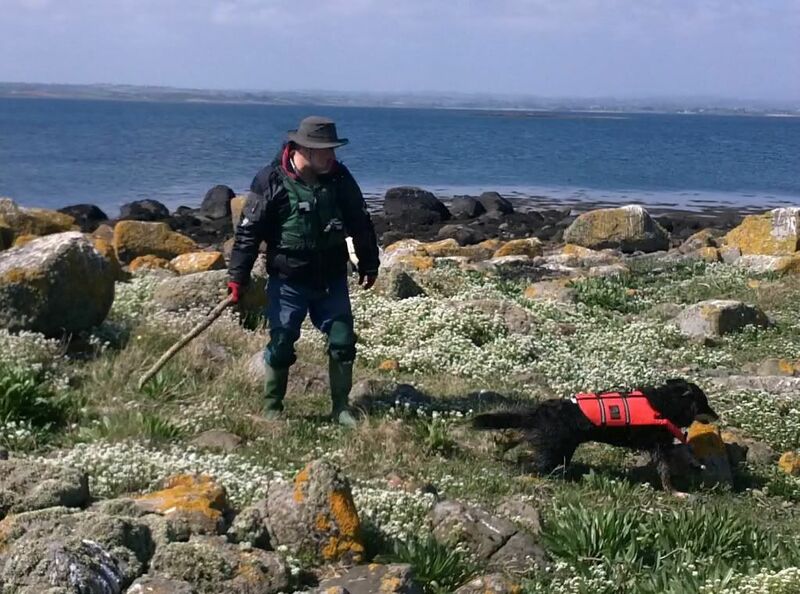 The Beardy Rocks group can be explored on foot at low tide and has its own access and is fun to explore in a canoe at high tide. Green Island is on its own at the outer end of the narrows with foot access by a sandbar at low tide. The rock reefs around it are home to a large colony of seals. Beardy Rocks and Islandacorr, blog. Swan Island, the end of the Quest. Last edited by Mr Nick; 13th-October-2014 at 07:31 PM. Is that known as "throwing down the gauntlet" to others? Loads of excellent info, thanks for sharing. Makes me wish it was within short range of me. I'll have to make it over there somehow one day! Last edited by Mal Grey; 13th-October-2014 at 08:25 PM. Well done Mr Nick and thanks for letting me join you on this escapade. Hats off to you, Mr. Nick. Wow lots of work went into that - very informative. Thanks for sharing! Those of us with visual acuity problems thank you for the font! The rest of us just thank you for an extremely informative post... and for a very entertaining series of blogs in the past! Wow, Mr Nick, that throws a lot of light on the seldom visited parts of the lough. Thanks for a good work of reference for future trips. Thus we while the hours away"
Thanks Mr Nick for this wealth of info. Herculean efforts made to get to all those islands, and to document it so clearly.